in the field can depend on a trifle." so our customers are not faced with unpleasant surprises in daily use." precise analyses and comprehensive tests"
is the greatest pleasure for me." 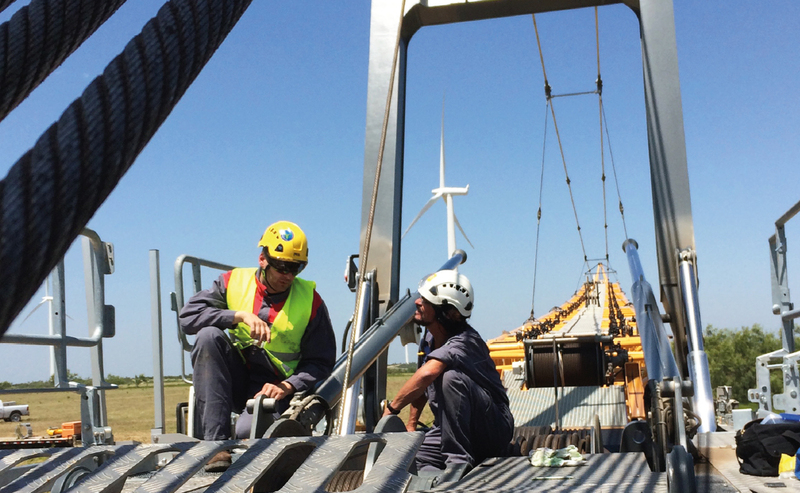 People’s safety - and sometimes even their lives - depend on the reliability of steel wire ropes. Therefore, we leave nothingto chance! For the selection of a high performance steel wire rope, reliable specifications such as breaking force, discardcriteria, but also rotating characteristics, service life, and spooling characteristics are key for multilayer spooling use. Each parameter has a direct impact on the total operating costs. Each step of the development work performed by TEUFELBERGERis based on the real conditions prevailing on site at our customers. Using one-of-a-kind and state-of-the-art systems for testing and analyzing we can examine ropes in every detail. This is how we develop premium high performance steel wire ropes excelling in each specific application. Our employees are the best in their field and combine their know-how with the first-class technical facilities at TEUFELBERGER. We don't talk about quality - we deliver it! TEUFELBERGER has an extraordinary number of measuring and test facilities on hand. A rope is subjected to quality control from development, incoming inspection and production through to product testing and the analysis on site at the customer’s premises. A development environment is one thing, the actual use of high performance steel wire ropes on site is another. We at TEUFELBERGER have unique technical equipment available to test our ropes in advance under realistic conditions. The unique crane rope test rigs have been developed together with leading crane manufacturers and fully reflect the real conditions of use for our high performance steel wire ropes. TEUFELBERGER’s application engineers are always present during field tests. The findings obtained in these tests are directly incorporated into the development work. In this process, the permanent know-how exchange between crane manufacturers and TEUFELBERGER plays an important role - especially in the phase before series production. The know-how of the application thus gained by us at TEUFELBERGER is unrivaled in the industry. Our extraordinary test and simulation facilities enable us to correct 75% of the errors even before the field tests are carried out. For more information about our quality see our folder “Quality is not a matter of chance”.